Chinese smartphone manufacturer Vivo has been experimenting with ways to get rid of the notch on displays, while maximising the front screen area. Its exhaustive efforts led to the formation of the Vivo NEX Dual Display smartphone, or the Vivo NEX 2, which features a secondary OLED display at the back. Having the second display means that when it comes to taking selfies, the secondary display will switch on and act like a mirror of sorts. This technology is novel, and as of now, restricted to the expensive echelons of flagship-grade pricing. The latest TENAA listing has hinted at the impending launch of a mid-range dual-display Vivo NEX smartphone. The detailed listing reveals all purported specifications, where the device’s dimensions appear to be 8.09mm in thickness and 200g in weight. The primary display gets a 6.39-inch AMOLED panel, with full HD+ screen resolution and 19.5:9 aspect ratio, while the secondary display at the rear gets a 5.49-inch OLED panel, with full HD screen resolution and 16:9 conventional aspect ratio. 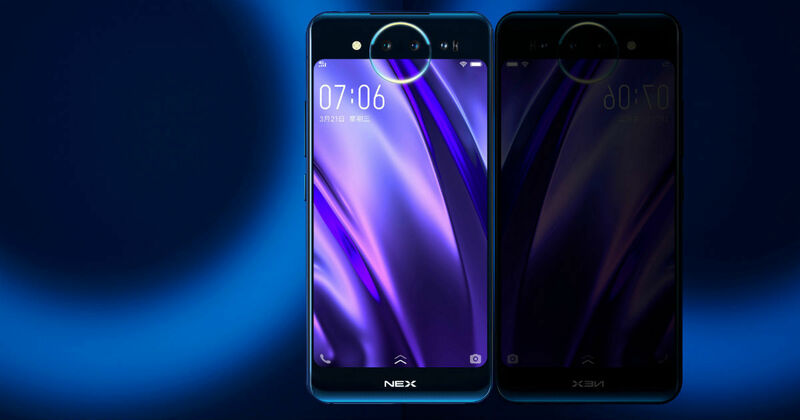 Instead of the Snapdragon 845 SoC powered the NEX Dual Display smartphone, there is a 2.2GHz octa-core processor powering this newly certified phone in question, with speculations suggesting that it may well be the Qualcomm Snapdragon 710 SoC. Other listed features include a 3.5mm audio port, a three-camera setup at the rear with 12MP + 13MP + 2MP arrangement, 8GB of RAM, 128GB storage, 3,425mAh battery pack, Android 9.0 Pie, and support for fast charging and in-display fingerprint recognition. This makes it a very well-equipped smartphone in terms of specifications, apart from the downgraded SoC, which in practical usage, may turn out to be good enough for most casual users. The listed phones are dubbed Vivo V1820A and V1820T in terms of codenames, and are different from the Vivo NEX Dual Display’s original codenames. As a result, speculations stand firm that these will indeed be new variants of Vivo’s dual-display phone, and since they have now appeared on TENAA, the mid-range variants may be launched in early 2019.